Ella lives in a tiny house full of big personalities. Older sister Amelia wants to be Left Alone so she’s grown a fringe to hide under. Middle sister Chloe is training to be a wrestling star, and she’s starting by eating her own weight in pudding. Little sister Lucy pulls the heads off dolls and dreams about sawing people in half. Then there’s Mum, who just wants five minutes’ peace. And for someone to get rid of that green furry stuff at the back of the fridge. Along with her large family, Ella’s home is crammed almost-finished homework and nearly-clean jumpers, unwashed cereal bowls and a vampire bunny called Buttercup. Ella doesn’t mind that you can never find any clean knickers or fresh fruit in their crowded house, but she does miss Dad who’s moved in with his girlfriend and their new baby, so she hatches a plan to get Dad’s attention. All she’s got to do is be more like her sisters. 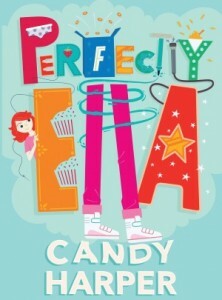 But Ella discovers that being someone else isn’t as easy as it looks . . .